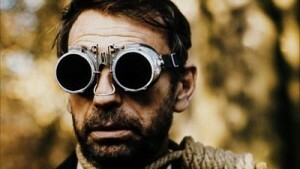 Costa-Gavras occupies a very singular place in the history of European film. In the late Sixties and early Seventies, when French and Italian filmmakers in particular were trying to figure out how to make relevant political cinema, he trumped them all by making a trio of fact-based political thrillers that were embraced by both the critics and the public. 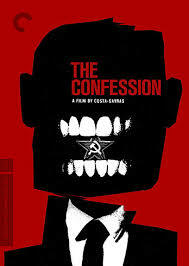 The Confession (1970) is the second in this unofficial “trilogy,” and by far the most demanding of the three. Although it shows no images of graphic or bloody violence, the film is difficult to watch because it illustrates the way in which a totalitarian state dehumanizes and grinds down its political prisoners. The state in this case is the Soviet Union-dominated Czechoslovakia in 1951-52. The individual we see being ground down, to the extent that he’s willing to confess to things that he’s not guilty of, is undersecretary of foreign affairs Artur London (Yves Montand, La Joli Mai). London was a diehard communist who fervently believed in Stalin’s rule, but who was targeted as a traitor because scapegoats were needed to prove Stalin’s infallibility. Thus he, like many other innocent party officials, was a defendant in a “show trial” accused of betraying the State, something he had never done (the essential “charge” was that he had collaborated with an American spy during his work on the side of the communists in the Spanish Civil War). The film thus operates as a Kafka-esque tale of a government gone mad, but also as an extremely realistic depiction of the way in which mind control works. The difficulty in watching the film comes from the repetition of abusive behavior — we see how London’s interrogators broke by keeping him walking, denying him food and sleep, and telling him to agree to confess to taking part in events that never happened. Costa-Gavras and his scripter Jorge Semprun (Z) made the Hitchcockian decision (think Vertigo) to reveal midway through the picture that London survived his ordeal. In these sequences, set in 1965, an older and healthier London tells two comrades what transpired during his imprisonment. Despite these flash-forwards the film is still very suspenseful, since the indignities London endures are so grueling that we still aren’t certain what lengths his interrogators went to in order to break him down. Other “external” sequences show London’s wife Lise (Simone Signoret, Diabolique) working to get him released and, in one very surprising scene, voluntarily denouncing him for being an enemy of the state. A lengthy interview included in this package with Costa-Gavras includes the revelation that London was released because Lise’s brother was an influential Communist party member in France, an element that is not mentioned in the feature. The Confession isn’t an easy viewing experience, but it challenges the viewer to think about torture and mind control, two topics that sadly are always timely, and it gives one the chance to see Montand delivering a superbly nuanced performance. Costa-Gavras worked with Montand several times — most notably in Z and State of Siege (which was released by Criterion on the same day as The Confession) — but this is without doubt their most intense collaboration. The importance of the film lies in its unflinching denunciation of the Soviet system, Stalin and beyond. Costa-Gavras was himself an ardent Leftist, and so was condemned by European communists for supplying “evidence of the immorality of communism” to right-wing governments around the world. By making this film, in between two flagrantly Leftist films, he made it clear, however, that he opposed injustice as practiced by any political system. Most importantly, the filmmaker continued here what he had first done in Z: create a politicized narrative that was compelling, suspenseful and enlightening for the average viewer. Using techniques from old masters like Hitchcock and his colleagues in the French New Wave (one of Godard’s greatest cinematographers, Raoul Coutard, served as d.p. here), Costa-Gavras made the film both modernist in the camerawork and editing, and more traditional in his reliance on a (fairly) linear narrative. This deluxe package comes with a number of supplements that highlight Costa-Gavras’ methods of storytelling, as well as the way in which the film accurately reflected the facts of London’s imprisonment and trial. In an interview shot for this release, editor Francoise Bonnot, who worked with him on nine films and won an Oscar for her work on Z, speaks about her careful editing of the torture sequences; she designed it so that they would drive home the message of the story but wouldn’t revolt viewers. She also discusses how she wove in archival footage chosen by Costa-Gavras of both the heyday of Stalin’s reign and the 1968 invasion of Czechoslovakia by the Soviet Union. A 1981 TV interview with London and his wife finds him revealing that he stayed with the communist party even after he was tortured and imprisoned, as he claims he never confused Stalinism with socialism. An even livelier interview is a 1970 talk with Yves Montand about the film. He explains that the filmmakers inserted the 1965 sequences into the film as “a window to give fresh air” to viewers. He also discusses his weight loss for the role of London — he lost 23 pounds to depict the character after he has gone through months of imprisonment and starvation. The question of making a film from London’s book The Confession is one that Marker confronts head-on by asking all the major participants if they felt the film would indeed serve as “grist for the mill.” The responses he gets are all negative, with Signoret’s being almost ridiculously polite (she maintains the film will make “good people” in all countries happy). Marker begins his short by showing footage of the real show trial recreated in the feature, and he ends it with some fascinating information — that London was condemned in a Czech newspaper in July 1970 for having written his book (this after Stalin had been dead for nearly two decades). Marker notes at the end that London’s Czech citizenship was revoked in ’70, thus implying that his book struck such a chord that it truly was important that it was adapted into a film, and thus experienced by a much wider audience.